True, you probably don't need to build your own alarm clock, because conventional ones are easy enough to find and buy. However, a Raspberry Pi alarm clock can offer a lot more than a conventional clock. For example, with a Raspberry Pi alarm can choose your own music, design a web front end, and create a simulated sunrise with a color LED strip. The instructions presented here offer a step-by-step guide for a basic alarm clock setup. 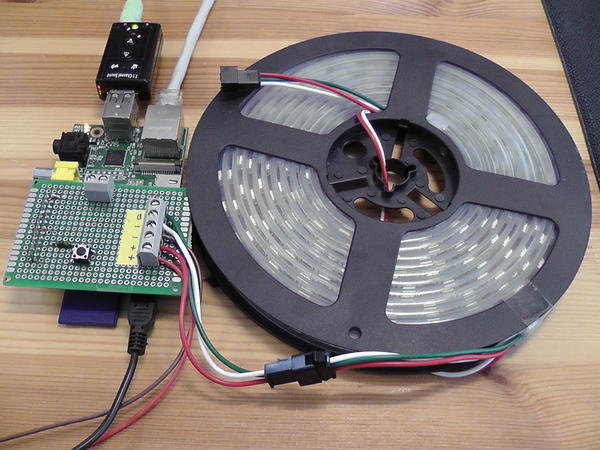 The process starts with an LED strip that can be controlled via the PWM controller of the Raspberry Pi. Then, the project deals with the core task of waking you up. Because the PWM controller will be taking care of the LED strip, you need an extra sound card. Additionally, services like MySQL and Apache need to be installed. Finally, a series of small scripts ties everything together into a smart package. A variety of LED strips are available for purchase from hobby stores and online merchants (see the "Suppliers" box). Two major differences distinguish strips. The strips are characterized primarily by the number of LEDs per meter and the type of controller used. The strip I used for this project has more than 60 LEDs per meter and uses the WS2812B integrated LED and driver chip as a controller . Each of the LED elements can be controlled individually and accept 16 million color values. The number of color values derives from combinations of red, green, and blue light, which emanate from three LEDs integrated into each element. The required data is transmitted serially via a special protocol that is dependent on correct timing. The nifty wiringPi library helps set up control of the LEDs via software . eBay and AliExpress offer low prices for microcontrolled LED strips, but if you don't want to wait four weeks for delivery from China, you will have to look for a local source of delivery. For example, Adafruit has a good selection . Theoretically, there is no difference between setting up a Rasp Pi alarm clock on a first-generation Raspberry Pi or a new Raspberry Pi Model 2 (RPi2). Practically speaking, however, as of mid-May 2015, the WS281x library  does not work on the RPi2 because of a bug . The manufacturer data sheet gives the maximum power consumption as 90W (18A x 5V). Obviously, this much power places too high a burden on the GPIO port of the Raspberry Pi; thus, an external power supply unit is absolutely necessary. You should heed the standards provided by the manufacturer and use an appropriate power supply unit even though the power demand for the run of the example program strandtest.py found in the WS281x library proved to be much lower during the first tests I conducted with a laboratory power supply. Additionally, it is best to provide power to both ends of the LED strip. Otherwise, the lights at the ends of the strip will be significantly less bright. This also explains why the LEDs do not shine with the maximum brightness when used for the Rasp Pi alarm clock. For the first test setup, you should connect the data line (Figure 1) directly to GPIO1 (header pin 12) on the Rasp Pi because this is the only output that offers genuine PWM functions. (Note that I am using the wiringPi pin numbering scheme .) Figure 2 shows the circuit diagram for this. The layout also contains a switch that is used to turn off the alarm. The WS2812B works well with the 3.3V levels on the Raspberry Pi. It would be necessary to adapt these for most of the other controller components. Figure 1: The test project is easy to set up. 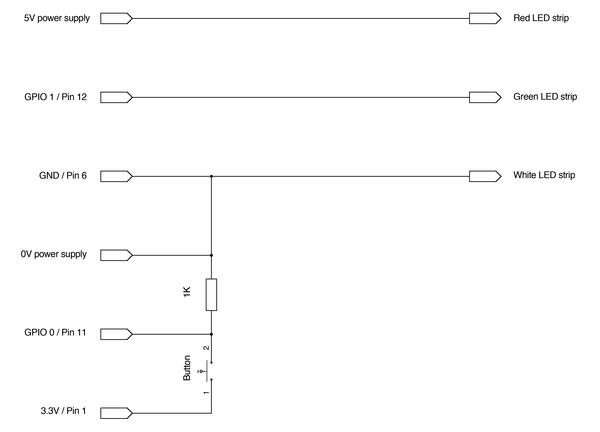 Figure 2: The circuit diagram for this project is straightforward. Once you have the hardware set up, you can begin installing the software needed for the LED strip (Listing 1). Make sure you have the most updated version of the software (lines 1 and 2). Then, install a series of Python tools and the command-line front end for Git (line 3). You can download the library for the control of the WS2812B as source code and construct it with SCons  (lines 6 to 8). Next is the installation of the resulting wrapper function for Python (line 10). The program all_on (Listing 2) turns on all of the LEDs at a little less than half of the maximum brightness. Turning the brightness of the LEDs up results in a drop in voltage inside of the strip and a noticeable darkening in the lights farther away from the power source. The only way to make sure all of the lights can shine at maximum brightness at the same time is to supply more power to the light strip by adding connections. all_on switches the LEDs on with 100 percent white light (Listing 2). all_off switches off the LEDs (Listing 3). soft_on increases LED brightness from 0 to 100 percent over five minutes (Listing 4). soft_off lowers LED brightness from 100 to 0 percent over five minutes (Listing 5). The listing fragments shown here include only the main methods. Complete listings are on the Raspberry Pi Geek anonymous FTP site . It is best to build the programs directly in the~/alarm/rpi_ws281x directory where the libws2811.a library for the LEDs resides (Listing 6). The compiled programs go into the directory where the scripts look for them (Listing 7). You should be careful when starting the programs, because the underlying library needs root rights; thus, the alarm programs need to be called with the sudo prefix. Semiconductor chips controlled by an I2C bus can be used in many applications. The PCF8583, an eight-pin clock and timer chip, is an interesting example. The Raspberry Pi has many amazing features, but it is missing a clock. We'll show how to add a real-time clock chip to your Pi. Around Halloween last year, one parts order brought together two completely different projects: a light-up dress and a thunderstorm for a model train layout. PiFace Control and Display makes it possible to build a variety of clever Raspberry Pi-based projects that require basic input and output. We help you to get started with this useful board.